Two-Toed Sloths are mid-sized mammals ranging from 9 to 20 pounds in weight and 2 to 2.5 feet in length. They have brownish-greenish fur that acquires its color from two species of blue-green algae which grow in the fur and provide exceptional camouflage. They possess compact tailless bodies, rounded heads and lighter fur around their large eyes. They have long legs with extremely long two-clawed forefeet (and three-clawed hind feet) which aid them in climbing high above the rainforest floor. Nicaragua, Panama, Venezuela, Guyana, Ecuador, Bolivia, Peru and northern Brazil. Leaves, tender shoots, moss and fruit. Up to 20 years in the wild and 30 or more years in zoos and other wildlife conservation centers. Females give birth to a single offspring which weighs about 1 pound. The young sloth clings onto its mother’s chest region and nurses. The young can hang upside down within 20 to 25 days but continue to nurse for the first five months of life. The young may associate with their mothers for the first two years before setting out on their own in their rainforest home. Females may gather together periodically. Males are solitary. Vulnerable: due to their strict rainforest habitat requirements, the future of these remarkable creatures is directly tied to the future of the forests which they inhabit. The Two-Toed Sloth, along with its cousins the Hoffman’s and Three-Toed Sloths, represents a primitive and fascinating group of animals. 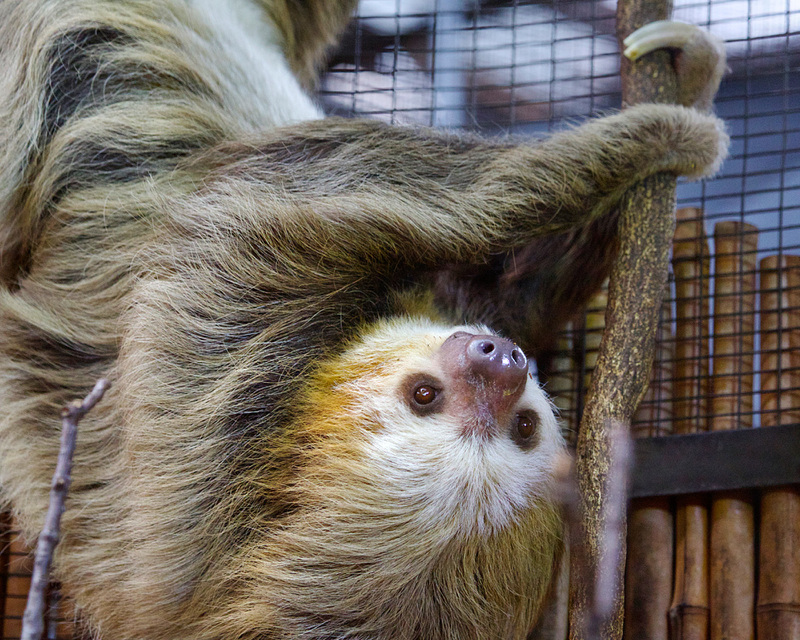 Sloths are nocturnal, arboreal mammals, meaning they are active at night and spend their time in trees. 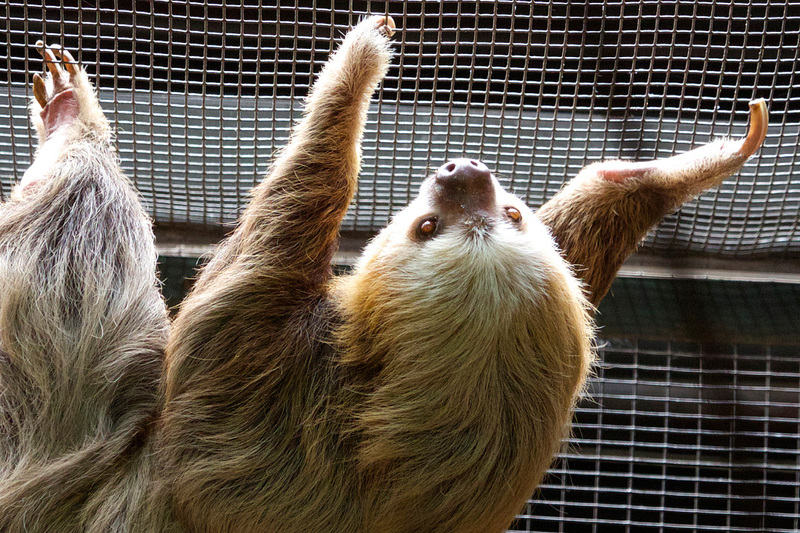 Sloths are the world’s slowest mammals. On average, these extremely slow-moving creatures descend from trees only once a week to leave their wastes and move to another feeding tree. They spend nearly all of their lives hanging upside down. In fact, their fur grows from the belly downward to their back. Due to high humidity and special grooves in their fur, algae easily grows in their fur, providing them with genuine “rainforest camouflage to go!” Pay close attention to the treetops in the Zoo’s rainforest building to spot Hope & Jabba.